Eastbourne Town might not be going straight back up to the Ryman South at the first time of asking, but they finished their season in style with a second win on the bounce at Crawley Down Gatwick on Saturday. John Lambert’s side had fourth place sewn up prior to kick-off but his side seemed to determined to finish with a flourish and took just three minutes to open the scoring. 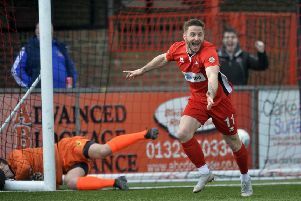 Had Kenny Pogue not departed for Hastings United in mid-season before returning, the season might have ended differently and he was on hand to give them the early lead from the penalty spot. Joe Dryer is another who has had a taste at Ryman Leagfue level and he would have been hoping to ply his trade at that level again next season. The winger started the campaign in fine form, finding the net with consummate regularity,and he was back among the goals after the half-time break to double the lead and put Town well in control of the tie. Jack Turner added the third and the final nail in the hosts’ coffin with 20 minutes left on the clock. The process of rebuilding for Lambert now begins, with numerous faces set to exit the Saffrons. Another promotion push will be the target for next season and if they can find the form that saw them leading the way at the start of the season they would expect to be one of the favourites once again. Saturday’s opponents, meanwhile, finished second from bottom and are left to contemplate a second relegation in a row and the prospect of Division Two football next season. Town team v Crawley Down Gatwick: Nessling, Hollobone, Paul (Duncan), Keehan (Clarke), Turner, Henson (Sutton), Ellis, Darby, Schaaf, Pogue, Dryer. Subs not used: Robinson, Heritage.